I'll admit to it now: I was in a bit of a brown study there at the end of summer break. But then the students came back and classes started, and things got a little better. Not great, mind you, but better. But I had a project under way, building a blanket chest to store some quilts, and there's usually nothing like a good bout of construction to snap me out of a funk. I knew that if I could just hold on until the Labor Day weekend, I could work on it more or less without distraction. I was counting on it. I was also reading a good book, Wooden Boats: In pursuit of the perfect craft at an American boatyard, by Michael Ruhlman, who had written another book I'd read and enjoyed many years ago, The Making of a Chef. I'd just finished another boat-building yarn, Sloop, by Daniel Robb, and found it a fine and satisfying read, so between the two books, I've been in a salty mood lately. I've also been craving seafood. Anyway, the weekend came and I headed to the shop, Kindle and mug of tea in hand. I'd work a little, then take a break and read about boat building and sip my tea while the first measure of autumn drifted in through the shop window. And in this way, I made steady progress. There's something interesting that I've long noticed about woodworking, though. On any given day, everything can go right--the power tools work without quibble, the hand tools are but extensions of my very thoughts, everything fits together as if they are two halves of one heart--and I will feel saucy and full of myself. I will even go so far as thinking that I'm getting pretty good at this stuff. And then on the following day, everything will go wrong. The router table fence keeps shifting and wrecking the line for the dado. A rail is cut too short. A tenon for the bottom rail is cut to fit the top rail. Saturday was the day everything went right. Sunday was the day everything went wrong. I've been through this before, though, so I knew there was nothing to do about it but laugh and cuss a little. And I persisted, keeping to my routine of working for a while, then stopping for a tea-and-read break. (I've found that if I work straight through for too long, I am prone to fatigue and mistakes--never a good combination around power tools. For this reason, I have, in addition to the usual tools, a comfortable plastic Adirondack chair for sitting, a nice radio and a small television, and a couple of large fans to move the air around.) Most importantly, none of the mistakes I made (and some were doozies) were any reason for panic. Rather, they were opportunities to problem-solve on the fly. I noticed this characteristic in the boat-builders in the book I was reading, too. They were all sailors first, and many had sailed all over the world, mostly in wooden boats. Sometimes things went wrong on those boats. Sometimes, in fact, they sprang leaks out in the middle of the ocean, or masts or tillers would break in a storm, or pirates would attack them. A sailor, it would seem from these tales, has to be resourceful by necessity. Plug the leak and find a nearby harbor to haul out. Drop a sea anchor and ride out the storm. Shoot back at the pirates. So this is how my day went on Sunday, when the gremlins were in the shop. Work, fix a mistake, sit and read. Work, fix a mistake, sit and read. After a while, I began to feel like I was on one of those boats, calmly plugging leaks and riding out storms. I didn't shoot at any pirates, but I did think about shooting at some squirrels who were throwing unripe pecans at the shop roof. I finished cutting and gluing up the panels on Saturday, and on Sunday I cut dadoes and tenons. It's about two-thirds done at this point. The brown study, however, is finished. I'm constantly amazed at the the kind of things you can do Susan! It's going to be lovely. I like your approach of sitting and reading through the rough patches. I agree, Susan -- you're a marvel, and this is going to be a beautiful chest! I think you can build me a huge writer's desk any time. I have $20. Jean--I like that approach, too. It has carried me many times. :-) See you at GWA! Nancy--You are a marvel, too, Nancy! Benjamin--If I could do it for $20, I'd build you a huge writer's desk Right Now. I get a note from Google when Sloop is mentioned somewhere, and that got me to your blog. 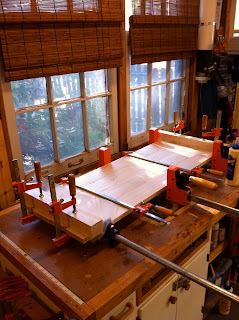 Good to see your blanket chest coming together (it's going to be great), and to read your blog - good stuff. Looks nice, and an entertaining read. Especially the squirrel part. If nothing good ever comes out of your squirrel problems, at least they're funny to the reader.